Digital records are easily created, edited, and deleted. Though digital records do not have physical form, they need to be managed just like paper records. Without any organization, including file naming and filing them into a file system with digital folders, digital records will be difficult to find and use. 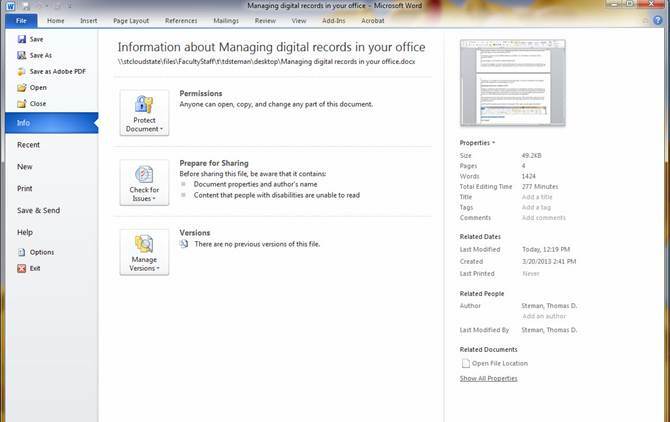 There are many strategies that can help you manage and keep your digital records accessible. Here are some helpful approaches for you to consider and, if suited for your office, to use successfully. Choosing a file format for your records is important. Why? File formats, especially those created and made available by software companies, may not have a long shelf life. If the files are no longer supported by the developer or the developer folds, you may not be able to open the file (remember WordPerfect and Word Star?). Unfortunately, it is hard to predict the future. So, choose as best as you can. For general office use, programs such as Word, Access, and Excel, which are supported by Microsoft, are safe bets, at least for the immediate future. At some point, these born-digital records may have to be migrated to an updated version of that software with a minimum of data loss. Accessibility. The file format must let staff members and the public to find and view the record. Flexibility. The file format needs to meet your goals for sharing and using records. If the file format can only be read by specialized hardware and/or software, your ability to share, use, and manipulate the records is limited. Longevity. Developers should (hopefully) support the file format long-term. If the file format will not be supported long-term, the records are at risk. Records should be migrated or converted if you determine a file format is no longer supported. It is often a good idea to migrate records to a new file format. For example, if your Word file is a version or two behind, consider updating to the new version. Word 6.0 documents (introduced in 1993) may not be able to open in the latest version of Word. But by migrating those files to a newer version after the software has been updated helps to ensure that the file survives with minimal loss. Converting a record to an entire different format is a possibility, too. An example is converting a Word document to PDF. Accuracy. If you migrate or convert records, the file format you convert to should result in records that have an acceptable level of data, appearance, and relationship loss, if any. Does the record look like it is supposed to? Completeness. If you migrate or convert the record, the file format you convert to should have an acceptable degree of data, appearance, and relationship loss, if any. Metadata, or information about information, can be entered right into a born-digital file. The metadata entered can inform you and others using the record about its creation, purpose, and use. Metadata can be entered or are automatically entered into the properties of the digital record. For example, it is easy to enter metadata into a Word file. Some information is automatically entered, including program name, when the file was created, last saved, last modified, and the number of revisions, as well as character/word count, line count, and number of paragraphs. Other information must be entered into the properties of the document. These include title, subject, keywords, and comments. The author information can be entered when first using the software. That information can be modified if needed. In the Word 2010, metadata can be entered by selecting the “File” option at the far left of the ribbon. Then on the right side of the screen, under Properties you can enter information for title, subject, tags, and comments field. You may have to click "Show All Properties" at the bottom to see additional fields. The metadata entered into a document can be searchable within Windows. Right click the drive where your files are. In the “General” tab, make sure the box is checked next to the phrase “Allow files on this drive to have contents indexed in addition to file properties. To check metadata for document, right-click on the file and select “Properties”. A file name is the chief identifier of a record. Consistently named records eases access to the information contained in each digital file. Version control. Determine how and whether to indicate the version of the record. Uniqueness. To avoid file names conflicting when they are moved from one location to another, each record’s file name should be unique and independent from its location. Persistence over time. File names should outlast the records creator who originally named the file - develop file names that make sense to staff members once the file creators are no longer available. Access and ease of use. The policy should be simple and straightforward. A simple policy will be more consistently used, resulting in records that are consistently named, and thus easier to organize and access. Ease of administration. The policy should work with the computer infrastructure to monitor policy compliance, manage records and records series, gather metadata, and perform other administrative tasks easily and in compliance with all legal requirements. Scalability. Consider how scalable the file naming policy needs to be. Analyze your work and develop a file naming system that best help your office. So, you created records in the course of your job that are in file formats that will last and are properly named. Now what? A well-designed filing structure will be paramount in managing and making accessible your records. A filing structure reflects the activities of your office through a careful structuring of folders with meaningful titles that will contain the records. Every office is different – what works for one office may not work for another. A functional approach focuses on managing records according to their business context (why they exist) rather than their content (what they are about) or their location (which unit or person that holds them). Second level - Activities are the tasks performed to accomplish each function. Third level - Transactions represent dealings with other units or people as part of the business process. Ask yourself then, what are the functions of your office? Then ask what activities are done to fulfill those functions? What transactions are performed to accomplish those activities? 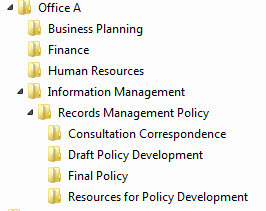 If a record could be placed in several folders, decide on one folder in which that type of record should reside. A shortcut then can be created in Windows that will point to that specific folder without having to create duplicate copies of records to be placed into several folders. This strategy will help in version control of a particular digital record. The actual documents would then be filled at the fourth level (Consultation Correspondence, Draft Policy Development, Final Policy, Resources for Policy Development). Files are backed up twice a day and kept for three weeks after the time of the backup; these files can be retrieved by right-clicking a folder, selecting “Properties” and then going to the “Previous Versions” tab. How Long Should the Records be Kept? Like records in paper form, digital records need to be managed to remain accessible, as required by state law. Yet at some point, records that no longer have value to your office should be deleted. Even though the records do not take any physical storage space like file cabinets, it is good practice to delete records that no longer are useful. Just like paper records, by deleting records that no longer have no value, they will be easier to manage. A way to determine whether or not records can be deleted is to decide if you need the record for future reference, not to keep “just in case.” Another way is through St. Cloud State’s record retention program, which is managed by the University Archives. It shall be the duty of the head of each state agency and the governing body of each county, municipality, and other subdivision of government to establish and maintain an active, continuing program for the economical and efficient management of the records of each agency, county, municipality, or other subdivision of government.